Doodle Crate is a subscription box which “inspires young makers to learn new skills and gain creative confidence.” Doodle Crate is geared toward the 9-16+ age group, but anyone can use and have fun with the DIY projects inside each crate. 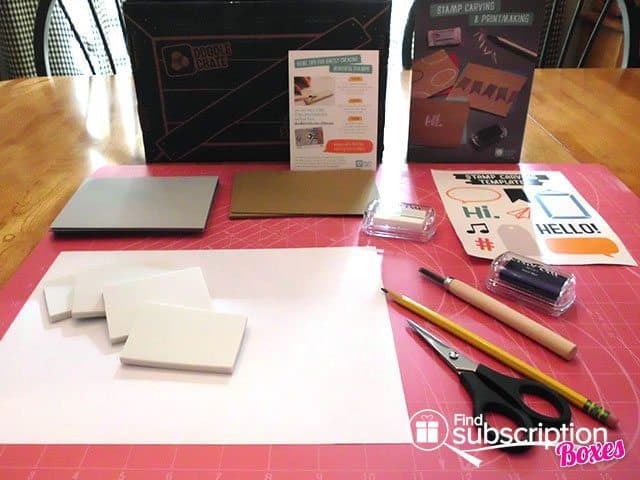 Inside the Stamp Carving and Printmaking Doodle Crate, you’ll find everything you need to create stamps with templates and a carving tool, plus the rubber blanks; quality pigment ink pads for printmaking with the blank cards and envelopes included. 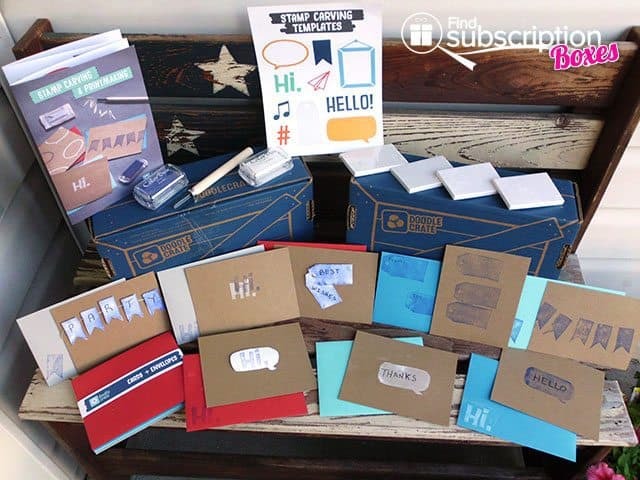 Also, you’ll find a brochure with easy step-by-step instructions, helpful hints, link to a video tutorial, project ideas, inspiration for creativity, and other ways to use the stamps in the future. First, open all the products to familiarize yourself. You only need to supply a pencil and a pair of scissors, but I would recommend a safe cutting surface or place something down to protect your work area from the carving tool and ink. 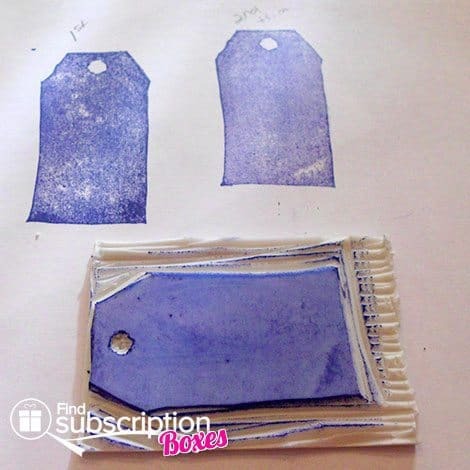 I would also recommend a damp rag to wipe the completed stamps, especially when going between colors—you can also wash them with a mild soap. It’s always helpful to have some blank or scrap paper to test stamps before using on the cards and envelopes provided. It will help you get a feel for the carved stamp and allow you to trim more, if necessary. And, it’s a great way to practice a few times before making your project. If you have extra embellishments or card stock, you can use that to enhance the cards, but it’s not necessary. Our testers included items made just with the kit, plus items which have added embellishments from our testers’ own stash. To create your Stamp, you’ll want to take the pencil and trace over your chosen template with the image faceup. 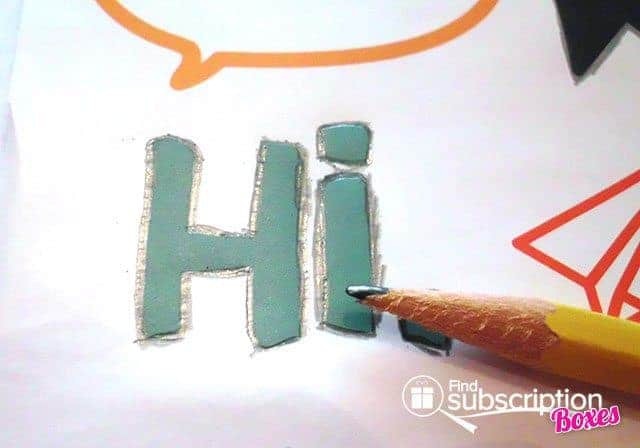 Then, turn the template over and place on the rubber stamp blank—this is demonstrated in the video tutorial—and rub with the wooden dowel end of the cutting tool to transfer the image to the rubber stamp blank. Be careful when holding the tool—it is sharp and can cut you. It’s important to rub with the pencil and transfer in this direction to make sure the image will stamp in the correct direction. Words may look backwards when transferred and then carved, but they will stamp in the correct placement. Now, you’re ready to carve. Be careful and always push the carver away from you to gouge out the design. The carving tool slides easily on the rubber stamp—go slow, it’s very smooth going through the rubber. Safety first will prevent overcutting the image and yourself. Younger crafters should be carefully supervised, but they’ll still have fun! Make sure your image is raised by carving enough away on all sides. You can ink the stamp and test on the scrap paper to see if you need to carve more away. Now, you can create more stamps with the blanks and templates provided or you can create your own image to carve on the blank. Our testers really enjoyed carving and testing the stamps! When you’re ready to begin Printmaking, place the rubber stamp with the design faceup and pat the ink pad over your stamp. You may have to do this several times to get even coverage. Then, turn your stamp over and place it onto your blank card. Press the palm of your hand firmly on the back to ensure the image transferred, then lift up. You’ve just created your own stationary! 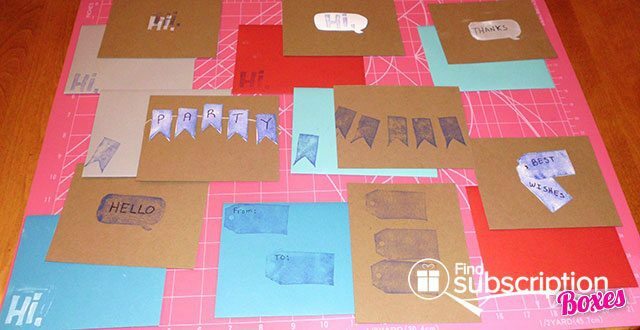 You can be as creative as you want using different colors, multiple images, and even decorate the envelope—no limit to your imagination! Once you’re comfortable with all that, you can even branch out and use other items you may have at home to embellish your cards even more or use the stamps on fabric or in many other ways. 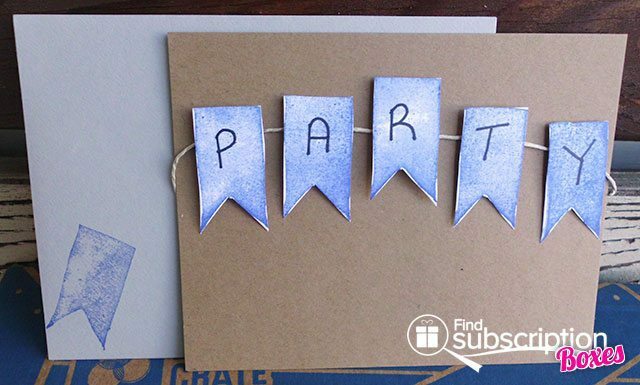 Use card stock, craft string and dimensional adhesive to create a 3D card that pops! The stamps are reusable, and there’s enough ink to use on many projects in the future. Helpful hints for storage: after securely closing the ink pad lid, store upside down to keep the ink pads moist. And, always wash your stamps when done. It keeps them ready to go and prevents ink transfer between colors. 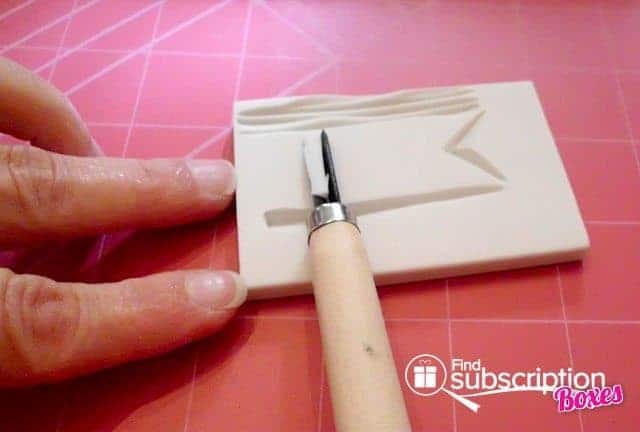 Save the plastic cover from the carving tool and place on cutting end when done—store in a safe place. 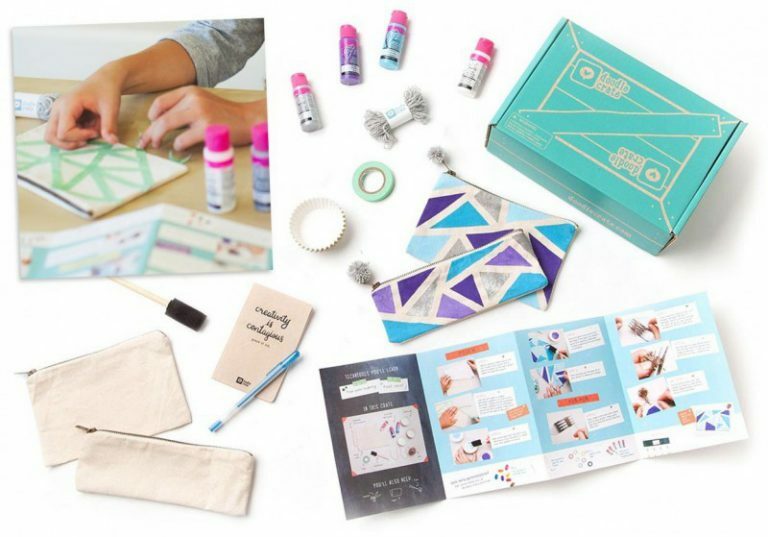 Invite friends over and DIY together! 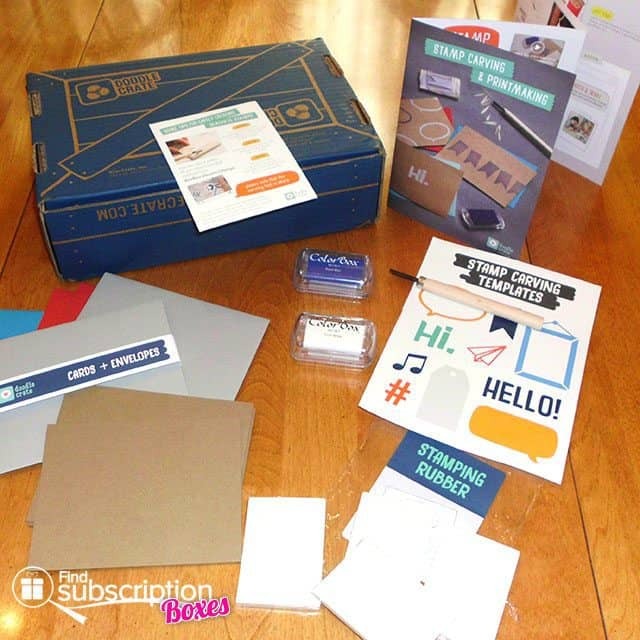 Doodle Crate help you Create and Learn with subscriptions plans starting at $16.95/month. We had fun making our projects, and you can, too! Through September 13, 2015, get your 1st Doodle Crate for just $9.95 + FREE shipping when you use Doodle Crate promo code LABORDAY10 at checkout – a 50% savings! Code expired? Use code FSB30 to save 30% off your 1st Doodle Crate! 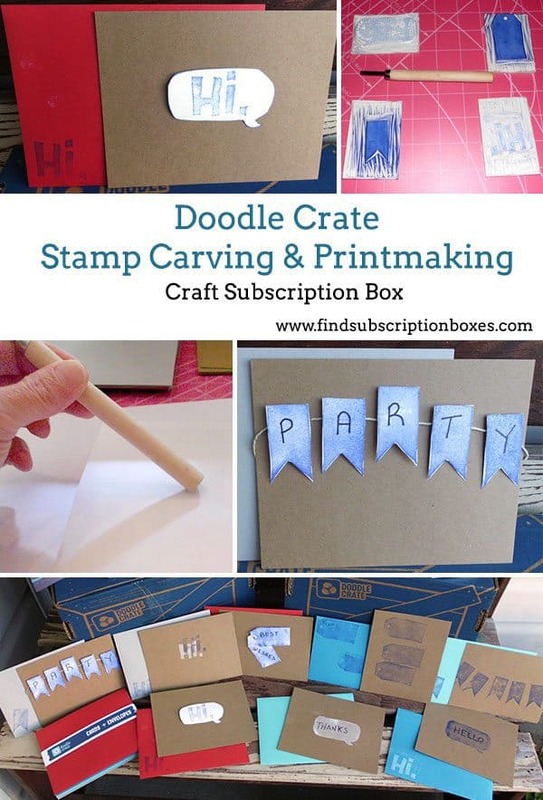 The Doodle Crate Stamp Carving & Printmaking box is also available for single box purchase. 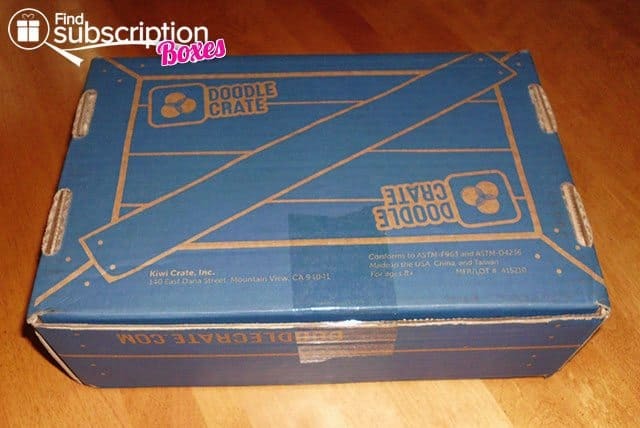 How would you rate Doodle Crate ?